Almost every home has a driveway in some shape or form. These installations are one of the most important aspects of any landscape. Driveways are the main vehicular access points to your home, tend to be taken for granted and property owners will often cut corners on it if they’re on a tight budget. At Stasi Brothers, we encourage our clients to consider their driveway construction carefully. If you use the right materials and hire skilled installers, this structure can easily last for a very long time. We have worked on several driveway installation projects in Hicksville, Jericho, Levittown, Syosset, Plainview, and Westbury and know that our clients here are satisfied with the results of our work, even years after installation was completed. Our clients in East Meadow, Massapequa, Old Bethpage, Carle Place, and Roslyn have been hiring our landscaping and masonry services since 1962 and know that they will get the best possible results. How Do We Install Driveways? Removal – Our first step is to remove the previous driveway or grass and level the ground as much as possible. This step is vital because uneven ground at this stage can cause problems on the surface at a later date. Our experts are meticulous in their work and will carry out the removal carefully, and ensure that the ground is completely clear of debris. Stone-Blend RCA – The stone-blend RCA will form the foundation of your driveway. As this installation has to endure high foot traffic and pressure from vehicular movements, the foundation needs to be strong and resilient. We make it a point to use high-quality materials and installation techniques to ensure the foundation is solid. 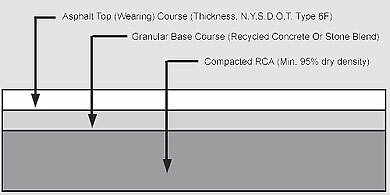 Belgium Block – Belgium blocks are usually installed on the foundation and are an essential part of any asphalt driveway. They don’t just add a decorative element to the driveway, but also act as a guideline when we install asphalt. Grading and Rolling – It’s important to grade and re-grade the earth until it’s perfect for the asphalt. If the ground is uneven, the asphalt will eventually crack. In the case of asphalt surfaces, we drive a roller over the graded surface to compress the stone and lock everything in place. Asphalt Installation – After that, it’s just the question of installing the asphalt. Once it is installed, we drive over it with the roller and let it set. Paver Installation – If we are installing an interlocking paver driveway, we ensure that the compacted sand is laid properly and that the pavers are installed to perfection. Seal Coat – The final step is to apply the sealcoat over the surface- this protects the surface from deterioration and staining. We only use high-quality products in our installations. If you have any questions about our asphalt driveway installation services here at Stasi Brothers, just get in touch with us. You can fill in this contact us form or give us a call at 516 997 7283.